When the Belt and Road (B&R) initiative was first announced by President Xi of China in late 2013, few could have envisaged the grandeur and ambition that it would entail. It has since generated considerable discussion and speculation about its specifics, such as what constitutes a B&R project, if there are commercial opportunities present and what the chances of success are. Kept broad and inclusive by the Chinese government, the B&R strategy has transcended many of its initial impressions and has proven to be much more. For example, there is a focus on developing bankable infrastructure projects supported by large international agencies, which infers that the B&R goes beyond just geopolitics and embraces the promotion of commercial interests, trade, culture and integration. Even though the B&R’s initial objective was to rebuild the ancient land network that connects China to Europe via Central Asia, it has subsequently gone beyond that to include building highways, railways, ports, airports and now even establishing a maritime route that cuts through from China to South-East Asia, South Asia, the Middle East, and eastern Africa. These activities are mainly focused along six economic corridors, which cuts across over 65 developing countries and is expected to be a catalyst for infrastructure development that will have an impact on a population of about 4.4 billion and one third of the global economy. 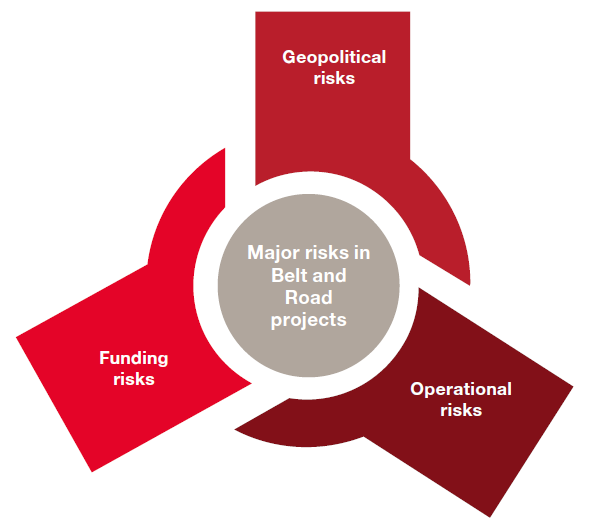 The Belt and Road also encompasses the development of an infrastructure ecosystem ranging from power generation and utilities infrastructure, oil and gas pipelines, to telecommunications transmission cables in a massive global connectivity plan. Even as its current focus is on outbound infrastructure development and trade enhancement, there are expected further activities in subsequent phases, which embrace social infrastructure such as education and healthcare, media, software and innovation as well as more focus on cultural and people-to-people exchanges, some of which are already underway. B&R also focuses on industrial and resource cooperation to drive trade and with this in mind, 70 cooperative zones have already been established. The objectives of the B&R initiative includes other strategic goals such as establishing global recognition in developing complex transnational infrastructure projects. The B&R is also clearly an important part of China’s ongoing national reform agenda, building on the “Go Out” policy launched in the 1990’s, and complements the current 13th Five-Year plan and the Made in China 2025 strategy. These outbound investments also further support the internationalization of China’s renminbi currency, which helps diversify currency risks. Since its announcement in 2013, there have been a number of key milestone achievements, including the first China-UK transnational freight train, which completed its 12,450km journey (through seven other countries in just 18 days) earlier in January this year. Also, the Jakarta-Bandung high speed rail project, for which the construction contract was signed in April 2017, is another flagship B&R project which fully adopts Chinese railway technological standards. The B&R initiative is such a massive undertaking that even China with all its resources, people and financing has sought partnerships with foreign companies. These partnerships can prove to be beneficial for China and foreign companies in many ways. Gaining knowledge through foreign partnerships can help Chinese enterprises further develop expertise, and enable them to enhance global credibility in the infrastructure sector. For foreign companies, a collaboration with Chinese companies in infrastructure projects in third party countries can help open up access to its large domestic market. Furthermore, foreign companies can partake as a private investor in projects that are risk-guaranteed by Chinese institutions, with an improved risk-return ratio. Successful partnership examples already exist, wherein foreign multinationals have become established equipment suppliers to Chinese engineering, procurement and construction (EPC) companies and have thereby benefited from a boost in orders both in third party markets as well as in China. Many of these foreign companies also possess previous experience in large scale projects in developing countries that are more complex. This is typical to B&R projects, with foreign companies able to contribute by establishing connections with local stakeholders, as well as having prior knowledge of managing an infrastructure project in developing countries. This can help to decrease operational risks which may be otherwise further enhanced especially when operating in less familiar terrain and business environments. 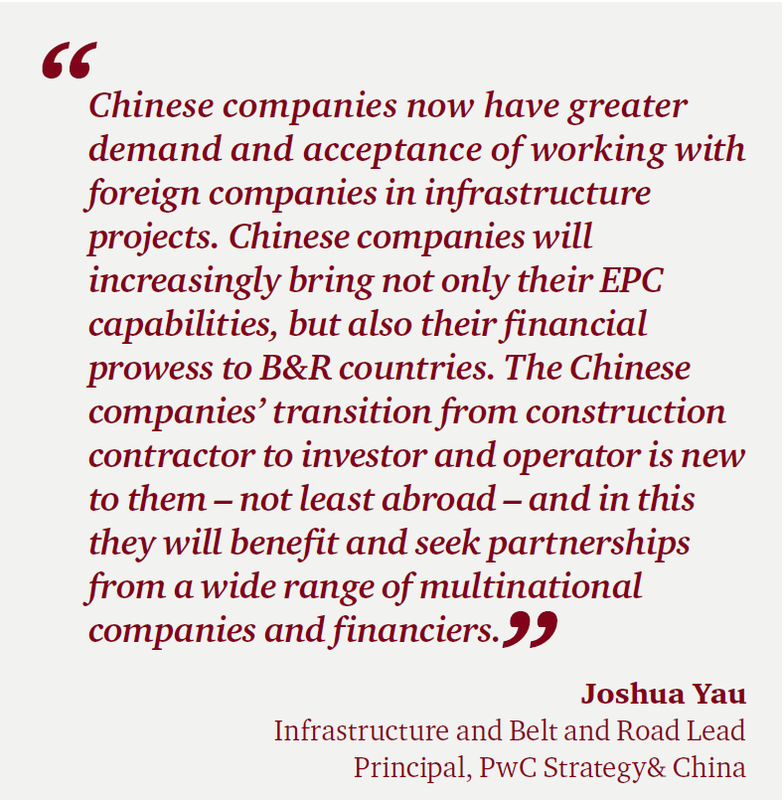 While the opportunities are numerous, foreign companies may find some project risks accentuated in B&R projects, particularly from a geopolitical, funding and operational perspective. Geopolitical risk takes on an additional facet in B&R projects that often span across many territories, due to the exposure to changes in political regimes and bilateral relations. Furthermore, companies should be cognizant of the funding risk in B&R projects. Aside to financing sources from China, companies also need to be aware of the other sources of funding available. This takes into consideration that many growth markets along the B&R routes have a varied ability to pay back the loans they need. In addition to geopolitical and financing considerations, interested companies ought to remain vigilant in operational planning, even as State Owned Enterprises (SOEs) from both China and the host countries are starting to gain international experience. Operational risks include gaps in experience of stakeholders and the increased complexity of B&R transnational projects which result in delays or costs overruns. It is true that the B&R initiative holds rich promise, but the risks are sometimes accentuated and unique. In addition to the evaluation of B&R specific project risks, potential investors should make a strategic evaluation as to which B&R projects to be involved in. This can be achieved with a commercial viability assessment, review of the maturity of the supporting ecosystem, and the confirmation that the project complements the company’s other similar projects. Commercial viability assessment: Companies ought to develop a robust business case, which establishes a credible market supply and demand. It should also address to what extent companies are reliant on incentives provided. Review maturity of the infrastructure ecosystem: In addition to this, companies also need to evaluate the maturity and future plans of the surrounding infrastructure. This includes whether there is a strong strategic partnership for policy development, multi-modal linkages and supporting facilities. Establish a portfolio fit: While companies consider their experience in selecting which projects to bid, they also need to balance the valuation of their experience against the exposure to too much of the same risk in the company’s internal portfolio. For example, for a company that already has a project in operation in Kazakhstan, might re-valuate whether it makes sense to add another at this time. Despite their experience, the additional commercial, social and geopolitical risk exposes the company’s entire portfolio. Having identified which projects to be involved in, and evaluated the risk, companies can enhance their chances of success by taking some critical steps. 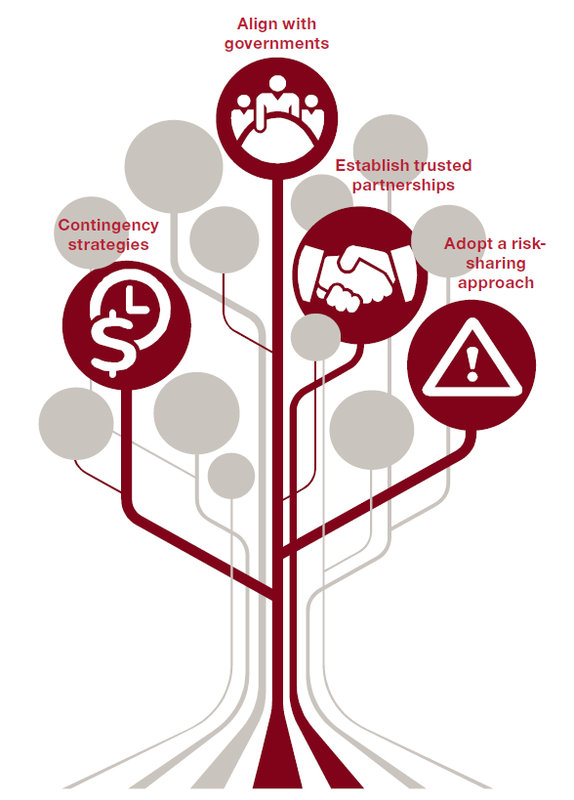 Contingency strategies: With B&R projects which typically attract geopolitical attention and straddle multiple territories across a long period of time, it is critical for companies to plan for disruptions in advance. In the course of contract negotiations, any potential unresolved issues should be accounted for in contingency clauses and a clear exit strategy laid out at the outset. Risk sharing: Lastly, risk allocation is an important consideration in B&R projects where there could be more stakeholders, who exercise larger influence on the occurrence of the risk. Adopting a risk-sharing approach will build trust amoung stakeholders, ultimately lowering cost for all stakeholders. Companies can consider ways to share risk, such as waiving the need for performance bond, carrying the cost of some equipment on their books or developing a revenue-sharing mechanism. Therefore with the development of contingency strategies, alignment with governments, trusted partnerships and a risk-sharing approach, companies can be well positioned to tap into the B&R opportunities. Besides adopting a risk-sharing approach, contingency strategies, and strengthening capabilities with key partnerships and government relations, foreign companies can leverage existing international platforms, such as in Hong Kong and Singapore, to further position themselves for success. In this regard, knowledge portals on the B&R initiative have been set up by government entities in Hong Kong and Singapore, which provides information on the Belt and Road and its activities. These entities also organize events to provide a networking platform for foreign companies, local companies as well as Chinese enterprises seeking collaboration opportunities. These different platforms are each positioned with unique strengths. With greater proximity to mainland China, Hong Kong is strategically positioned to help foreign companies establish connections with Chinese stakeholders and gain more insight to better navigate working relationships with Chinese companies. Whereas, Singapore, on the other hand, is well placed between China and Southeast Asia, with strong connections to the rest of the Southeast Asian countries, and can support foreign companies who are interested to tap into opportunities in the region. Whilst these platforms exist, there is still a need for more platforms to be created in support of the B&R initiative, especially to provide more European and American companies with information about the B&R initiative and how they can get involved profitably. The B&R initiative is of an unprecedented scale that will drive massive global infrastructure spending and create numerous opportunities that warrant foreign companies’ involvement. There have already been many success stories of Sino-foreign partnerships that has resulted in mutual benefits, leading to increasing demand for foreign capabilities and contributions to B&R projects, which reaffirms that there are commercial opportunities across the infrastructure value chain. However companies need to fully understand the potential risks of infrastructure projects especially those unique to B&R in order to prepare for success. Acknowledging that B&R projects are different, companies can enhance their chances of success by taking some proactive actions such as establishing contingency plans to manage short term disruptions and plan for lengthy project lifespans, while also building strong and respected relationships with local authorities in order to effectively navigate the political and local bureaucratic scene. The B&R initiative is a vast and ambitious undertaking, which foreign companies ought to not ignore as a purely Asian affair, but instead embrace. It is possibly the largest transcontinental infrastructure programme the world has ever known. And it is only just beginning.